The glittering Lagos social scene hit a high tempo when influential guests including former Nigerian President, Chief Olusegun Obasanjo and first-class monarchs gathered for the 50th birthday ceremony of Mrs. Omolara Omobolaji Adeagbo. It was a particularly joyful moment for the celebrant who wore smiles all through the milestone celebration which unfolded at the classy The Civic Centre, Victoria Island, Lagos- and what made the occasion extra special was the presence of world renowned gospel singer, Don Moen, who serenaded guests at intervals during the course of the colourful event. As a committed Christian, who faithfully believes the words of Isaiah 40:31 “But those who trust in the Lord will find new strength. They will soar high on wings like eagles. They will run and not grow weary. They will walk and not faint”, Mrs. Adeagbo began this great day with a soul-lifting thanksgiving service. A well-decorated venue within The Civic Centre Complex was where the thanksgiving service unfolded. There was an intimidating red carpet that welcomed guests as they stepped out of their vehicles on arrival. That was not all, smiling, courteous and well-clad usherettes were also waiting to receive them-and, the celebrant’s loving husband, businessman, Foluso Adeagbo was there too to personally say welcome and usher them to their seats. This venue, like the hall where the main celebration occurred later, was creatively transformed by Mrs. Uche Majekodunmi and her team from Newton & David, The ambience was indeed classy and cosy. As guests settled into their seats, they were serenaded by soft gospel music rendered by the choir of Emmanuel Chapel, Banana Island, Ikoyi, Lagos. Proceedings began when the officiating Ministers: Prelate Ola Makinde, Archbishop Ayo Ladigbolu, Very Rev. Kanyisola Ajayi, SAN and other Pastors of Emmnauel Chapel were comfortably seated and then the celebrant stepped into the arena in style. Mrs. Adeagbo came to her special day looking glamorous in a figure-hugging understated green outfit that complimented her simple persona. 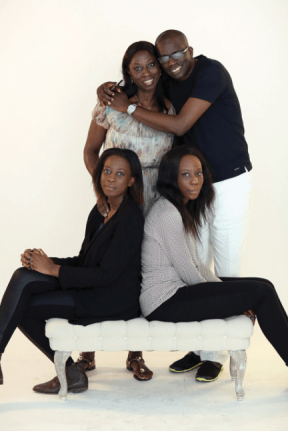 She was obviously filled with indescribably joy as she was surrounded by her two daughters; Morenike and Modupe, husband, friends from way back, as well as close and dear family members. There was an opening prayer by an Emmanuel Chapel Pastor, and then, the service was taken over by a wonderful medley of popular Christian choruses by the Emmanuel Chapel Choir. The First Reading was taken by the celebrant while her daughter, Modupe Adeagbo took the Second Reading, this was just before Archbishop Ayo Ladigbolu (Rtd), who has known Mrs. Adeagbo for over 20 year, was invited to deliver a short sermon. He began by applauding the celebrant for the decision to thank God on her birthday and went on to note that when he received the invitation, he was fascinated by the attributes of the celebrant that were highlighted there. These included: God-fearing, beautiful, faithful, gorgeous, supportive, wonderful, fabulous, blessed, diligent, loving, trendy and joyful. Achbishop Ladigbolu noted that the celebrant should be thankful because God has spared her life long enough to celebrate her 50th birthday. He revealed that since their first meeting in Ibadan, Oyo State Nigeria on the day of their wedding thanksgiving, Mrs. Adeagbo has remained her same caring, cheerful and respectful self. He noted that he was inspired by the description of the celebrant on the invitation to also come up with his own words to describe using the first letter of her names: O-obedient, M-merciful, O-overcomer, L-lovely, A-adorable, R-resourceful and A-amiable. That was not all, he continued: M-modest, O-omo Obembe, B-beautiful, O-omoluabi, L-lively, A-accommodating, affectionate and aya Opeyemi, J-jovial and I-industrious. The man of God then broke into a song and urged the celebrant to reflect on all the past years, and ask herself if God had not been good to her? Reflecting on the past, he said, was the first look. As she was reflecting, which he noted was a good thing, Archbishop Ladigbolu stated that she should remember that there were things to confess and things to appreciate. He noted that she should not let the past hold her down because after having confessed, she had become free of any sin and was a new person. The second look the celebrant must take is the inward look, according to the man of God, who quoted Lamentations 3:4, Eph 5:1-2 and II Cor 13:5. Adding that after she has done this, she can change the things she would like to change and set her mind on the wonderful years ahead. Again, he broke into a song and this time, asked the celebrant to join him-and she did not hesitate for one second. Probably moved by her eagerness to thank God, the entire congregation was on its feet and they chorused to the spirit-lifting song. He rounded off by showering the celebrant and her immediate family with prayers. What could be described as the highest point of the service was when the superlative gospel singer and Pastor, Don Moen took to the keyboard, strummed some of his popular tunes and sang straight from the the heart, captivating the congregation for minutes. The venue was transformed into a praise and worship centre that very moment, as guests sang along and were definitely in synch with the sought-after multi-instrumentalist and singer. His world class performance was a fitting finale to this segment of the celebration. Immediately after the service, guests were ushered into a small area were canapes, cocktails and other assorted drinks were served. There was soft music wafting from the PA System. The atmosphere was cool and breezy. It was a very good opportunity for many to exchange banters, relax and recharge before moving to the main event. Wow! One cannot but exclaim when you step into the venue that the Adeagbo’s had selected to host this golden Jubilee reception and party. It was simply heavenly. From the ceiling to the floor, everything was well thought out. The lighting, the chandeliers, the fresh flowers, the draperies, the centrepieces all combined to present an elegant and enchanting feel. It was the golden lady’s arrival that marked the beginning of this segment. Adorning a gorgeous golden number, she danced into the ceremony escorted by her husband and daughters. The background music was provided by no other than Africa’s No. 1 Disc Jockey, DJ Jimmy Jatt. Opening prayer was by Archbishop Ladigbolu and after that, the reception took on a life of its own. It was planned to be fun and filled with turbo-charged excitement-and the organising team led by the celebrant’s husband, Foluso Adeagbo delivered big time. The Master of Ceremonies was top comedian, Gbenga Adeyinka 1st, who was at his professional best. He anchored the event smoothly and only dropped elevated jokes when necessary. It was Adeyinka who invited the celebrant and husband for a dance and a few lovey-dovey moments. He commandeered them to re-enact their wedding day and seal the moment with a kiss. It was all so hilarious. Later, joined by her family, she cut her lovely cake. The first-rate monarchs in attendance also joined the Adeagbo’s for a photo session as well as her close family and friends. Her daughter who had just graduated from a London University also used the occasion to cut her cake, one could see the joy that emanated from the faces of her parents. That session was rounded off when Mr. Kola Gbadamosi, her friend and birthday mate of many years joined her-and together with their spouses, cut the cake and smiled to the paparazzi. Again, Don Moen took centrestage and he revved up the tempo. His performance was gripping and inspirational. It was a surreal experience for many who were watching him perform for the very first time. That was not the only entertainer in the house, BJ Sax was on hand to titillate guests with his medley of songs. The Faith Band also gave a master class performance-and by far the show stopper was the surprise appearance of multiple award-winning Nigerian artiste, Dbanj. He electrified the venue for minutes. Guests could not resist the pull of his music. Smartly, he began with his old but popular songs and gradually worked everyone up to a crescendo and so, when he dropped his 2015 hit “Emergency”, everyone including the celebrant and her usually reserved husband danced with no inhibitions. Without any shadow of doubt, this was a milestone of a celebration, one that will be etched on many hearts for years to come. First of all, I give thanks to the Lord for His mercies, because if not for Him, I won’t be like this, and I won’t be where I am today. A lot of my friends used to ask me, how do you look like this? Do you keep fit? Basically, I really don’t do a lot of exercise, I do go to the gym, maybe 2 or 3 days a week, but mainly I am involved in Pilate exercise. But God has been good to me. On the eve of my birthday, which was on the 4th of August, we stayed awake till about 12 midnight. My mother in-law, my sister, my daughters, and my brothers in-law were around, so we prayed together when I officially reached my golden age. That prayer session was very important to me. 50th birthday is not actually to ask God for anything, to me, it is just to reflect on His goodness, and just to give thanks for what He has done in my life. And just to celebrate and enjoy myself with my friends, and I’m just so grateful for where I am today. Actually, I started my birthday on Wednesday the 3rd of August, and because I am very passionate about children, I just love them, and especially the less disadvantaged or privileged ones. So, on Wednesday, the 3rd of August, we went to an orphanage in Lekki, Lagos to see the children. We had a meal with them, we took a cake to them and spent time with them. That was the first thing I did for my birthday. The most important thing for me, just like I said was to give thanks. A lot of times, we keep asking God, we want this, we want that, but we should be grateful for what He has given us. So, I think it was very important for me to start with a thanksgiving, and give thanks to my God. To thank Him for all the wonderful things he has done in my life. For my lovely children, my wonderful husband, my family and friends. It was a period of showing gratitude. You mentioned your husband and beautiful daughters. But one big question that has been popping on my head was Don Meon, whose idea was it. Oh my goodness. You know, Don Moen has always been one of the people I admire. I will call him a role model, because as a young Christian, I listened to lots of his music. There are a lot of gospel artistes, but one thing that really fascinates me about Don Moen is that most of his songs are really about giving thanks, about being grateful for what you have, and this is what I loved listening to most of the time. And it has always been my dream to meet him one day. I have seen him on TV, I have listened to his music, my church will always sing praise and worship using Don Moen’s songs, and by the grace of God, my husband knows him. I didn’t actually ask for it, but my husband knew I love his music, and I was always playing it. So, he was the one that surprised me with Don Moen. It was awesome that he came to celebrate with me. I don’t know. The kids did it with their dad. I really love his music; I dance to it even though they used to tease me and say mummy you can’t really dance. I usually try my best (laughs heartily). So, I only knew he was going to perform when he was being introduced. It was so nice to go and meet him on stage. The other artistes who performed all entertained people very well. They all made the day extra special. I grew up in a big family. It is a family of about 10, and I was a middle child. It was a very close family, and my parents were very close. My dad was very loving, my mom was like a housewife, we just did everything together. It was a very happy childhood. My childhood was very fantastic. Very very quiet, I was a shy girl, I was really quiet right from my primary school to my secondary school and the university too. I am a very quiet person. ‘Omolara’. ‘Omo’ is child and ‘Lara’ is like my family, so, that means “The child who is the foundation of the family. And Omobolaji, Again “Omo” means child and “Bolaji” means bearer of good things like wealth. I can say Omobolaji means the child who arrives amidst wealth. So many fond memories, so many, and some of the ones I will never forget are with my dad. My dad wasn’t strict at all. My mum was the disciplinarian, because my father was a business man, he travelled a lot, and anytime he went away, we were always anxious for him to return, so we can all gather around the table and eat. We were all used to sitting around the table, eating together from the same bowl and sharing the meat. That united us and made us one big happy family. We all loved one another. It was just fun growing up in that family, with my dad, mum, and my siblings. I did Philosophy at the University of Ife, now Obafemi Awolowo University. I was going to study Law for my second degree. I did Philosophy because I believed that was a good stepping stone to Law. But God actually took over and after my Philosophy degree, I travelled abroad. And I developed other interests. Oh my goodness! A long story…we met at the University of Ife, now Obafemi Awolowo University that was in 1985, I still remember, it was just like yesterday. I was in the Department of Philosophy, and Foluso was also in my University. We met a couple of times but we really didn’t talk because I had my friends, and he had his own friends. So, all we just used to do was to say hello, hello to each other. It was therefore very strange the first time he came up to me. He didn’t even ask me out for a date, he just said; I want you to be my wife, “I want you to have my kids”. I was shocked! My first reaction was who is this joker, I thought maybe he wasn’t really serious that maybe he was just joking, and my response obviously was; “I’m sorry, No. I am not interested”. But obviously the man knew what he wanted and he went for it, and the rest is history. The thing is we grew up together. I was very young when I met Foluso. Typically, he was my first boyfriend, we were very close, and even then, when we started dating, he was like my brother. So, when you’ve known someone for that long, it is natural that he would become my soul mate. When we are together, When I want to say something without opening my mouth, he knows what I want to say. So, I think it was destined by God that we will be together. I’m just so grateful, I love him so much. He is just a fantastic husband, and a fantastic dad to my children. I thank God. I am so grateful for our beautiful daughters. God-fearing and obedient children. I keep telling them that the most important thing in life is putting God first in everything that they want to do. Their education is very important to them. As you are aware one of them graduated a few months ago, and it was celebrated on my birthday and our other daughter, she is in New York. She studying at the New York University. They are pursuing their dreams, and I’m just so grateful to God for His blessings and for who they are. I just relax basically. I just stay at home. I am trying to just settle into Nigeria, and start a business, because I would like to live in Nigeria again. I come back to spend time with Foluso. When I am here, sometimes, I just visit the Gabfol Lounge (at the Murtala Muhammed International Airport) that we own just to see how they are doing and basically I just enjoy being in Nigeria, just to be with my family and friends. To balance work and home is not an easy thing. But I must say, I am blessed to have my husband, who gives me peace of mind. He is not the kind of person that troubles you or that is always giving you headache. My life is stress free. So that makes it easy for me to juggle being a wife and a mother, and I thank God for him and for who he is. Most of the time when I want to relax, especially when I am in London, I love Pilate and yoga. So, I go to the gym, I’m not really one who goes on the tread mill. I like group exercise, and when I do Pilate and do yoga, it is just to relax and to help me think, and reflect. Think of maybe like late in the evening of what your day has been like or what your plan is for the next day. Most of the time when we have the time, when my husband has the chance to escape the busy Lagos life, we do go on holidays as well, just to spend time together. About life in general, I must say I love my life. I love my life, I’m happy with my marriage, I love our daughters, I love my in-laws, I am very content. I am happy with my life, but we will always have to look forward to doing something better to improve. Like I said, on the 3rd of August I went to the orphanage, to meet the less-privileged children, I was grateful, I thank God for what we have, but I would love to do more, because my background is in children, child care and education. So, anything to do with children I am all for it. I would love to do more, to support children, to volunteer, and just do other things to support the less-privileged. Definitely back home in Nigeria, that’s definite. There is no doubt about that. Did you know we Nigerians are the happiest people in the world? Even if you go to the market, you will see people that don’t have much, but still wear smiles on their faces. The way they talk to you, and relate with you is so nice. But back in the UK, sometimes you don’t even see you neighbours for weeks. I’m not sure about the weather, but maybe you are right, because when the weather is nice, when we have sunshine, everybody just comes out and become different people entirely. I love my country, I love Nigeria, and I will love to be back here in ten years, and to invest here and to give back to where I was brought up, where I was born. And business wise like I said, I want to set up something back here in Nigeria. Definitely, it will have something to do with children. Without God, who am I? Where would I be? He has played all the roles for me, I cannot even emphasis enough how grateful, how thankful I am, for the grace of God in my life. For all the favours, all His blessings. A lot of things happen and you don’t even know that maybe something has happened because God has taken control. So, I can’t but just say, thank God, I’m so grateful, I’m so thankful to God for my life and for our children, and husband as well. Ok, I want to repeat what I have said throughout this interview, which is to give thanks to God. Thank you Lord, thank you Father for Your mercies. And to say a big thank you to all my family and friends who have been with me. They have been with my family, they have been with us throughout the highs and the lows, we’ve gone through a lot of things together. I have heard the phrase “Love at first sight” but never thought I would ever fall in love with a lady I barely knew, just like that. But here I am, ready to spill the beans on how I was captivated by a young girl known and addressed as Omolara Omobolaji Eninake Tosho-Obembe , as she then was. Sometime in 1985, I was climbing the stairs at the Department of Philosophy, Humanities Building of the University of Ife, now Obafemi Awolowo University. I took one good look at this paragon of beauty. She probably caught my strong and fixated stare.